Preheat the oven to 170°C, gas mark 3. Line 3-4 large baking sheets with parchment. Place the egg whites in a clean, dry mixing bowl and whisk until they form stiff peaks. Meanwhile, using a coarse sieve, sift the ground almonds and icing sugar together into a separate bowl. Take a large metal spoon and gently fold a third of the sugary almonds into the egg whites until smooth. Repeat until all the almonds are incorporated into the mixture. Carefully spoon the mixture into a piping bag with a plain nozzle (about 1 cm size). Pipe into about 60 rounds about 2cm in diameter, allowing a little space between each. (See Cook’s Tip.) Stand for about 5-10 minutes before baking in batches for 15-20 minutes until firm but not coloured. Allow to cool for 5-10 minutes before transferring onto a cooling rack. When completely cold, sandwich the macaroons together in pairs with a little blackcurrant conserve. For even and uniform sized macaroons, draw 2cm circles on the reverse side of the baking parchment and use it as a guide when piping the mixture. Replace the ground almonds with 125g Waitrose Wholesome Whole Pistachios. Blitz in a liquidiser or food processor until very finely ground, then continue with step 3. 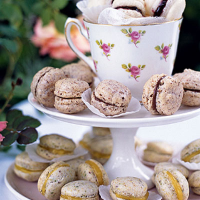 Use 6 tbsp lemon curd instead of the blackcurrant conserve to sandwich the macaroons together.